Salmon and other migratory fish attempting to return to their spawning grounds in the Pacific Northwest face no fewer than 400 man-made barriers in the Columbia River Basin, the earliest dating back to 1885 -- and there may be as many as 100 more constructed illegally on private property, tribal fish biologists estimate. The impediments to fish migration posed by such monolithic barriers as the 551-foot-high Grand Coulee Dam are well documented, but anadromous fish face a myriad of other obstacles as well. In the 129 years since that first dam was built in Spokane, Washington, fish passage has been restricted, if not totally eliminated, in many areas, tribal experts said at a recent workshop addressing the issues. And it's not just the Columbia River. "The tributaries and main stem Snake River habitat are probably in worse shape than on the Columbia," said Dave Johnson, program manager for the Nez Perce Department of Fisheries. "The main stem is a mess. All the Snake River salmon and steelhead populations are listed under the endangered species act or have been extirpated. Idaho Power Company is trying to relicense those facilities right now, and there are things they need to fix as part of that, things that are caused only by those dams being there such as the mercury issue, such as temperature problems." Biologists with the Columbia River Inter-Tribal Fish Commission (CRITFC) have documented most of these obstructions on a massive map of the basin. They gathered at a workshop in mid-March to review their individual projects ahead of the CRITFC's Future of Our Salmon conference to be held in Oregon on April 23 and 24. The goal is to restore historic fishing runs. Eliminating such obstructions is essential not only from a food-security standpoint, the experts said, but also culturally and spiritually -- though all are different facets of the same thing. "The deal we made with the Creator is that if we take care of our first foods, the first foods will take care of us," said Paul Lumley, executive director of the Columbia River Intertribal Fish Commission (CRITFC), which held the workshop. "Salmon are the first of the first foods." By 1980, river flows had been reduced by 50 percent, causing migration time to increase from weeks to months and decreasing survival, said Sheri Sears of the Colville Tribes. The granddaddy of all these barriers is Grand Coulee Dam, completed in 1942, which completely blocked upstream migration all the way into the headwaters in western British Columbia. But there's more -- much, much more. The Brownlee, Hells Canyon and Oxbow dams on the Snake River totally block fish migration across western and southern Idaho nearly to the Wyoming border as well, for instance. Moreover, these are all high dams. Besides Grand Coulee there is the Brownlee, soaring 420 feet. Others are only slightly lower. Their construction, and lack of any means to transport fish beyond them, has changed the culture of Northwestern tribes, whose members once depended on these fish for food. Ever since the first dams were built, biologists from tribes and governmental agencies have sought ways to get fish over, around, and through these barriers: large and small dams, culverts and even waterfalls. Currents and water temperatures have changed over the years, as well. The issue stretches all the way up into Canada, with nonexistent fish passage at the Keenleyside, Brilliant, and Waneta dams. Sockeye were once abundant there. "None of these facilities provide fish passage," Canadian biologist Will Warnack told workshop attendees. Different locations reported various problems and possible solutions. One practice that has proven effective is the use of pit tags to compare survival rates between dams. National Oceanic and Atmospheric Administration (NOAA) Fisheries biologist Ritchie Graves pointed out that it was relatively cheap, no handling was required, fish were from a known source, and it was an easy estimate to understand. In addition, he said, everyone using this technique sends their findings in, making for highly accurate reporting statistics. New technology sometimes replaces old, as cited by James Bartlett, fisheries biologist with Portland General Electric. For instance, Round Butte Dam once had a 2.8-mile fish ladder. That was discontinued a few years later, and they now use a truck and haul method for both juveniles and adults. A pipe releases the fish 20 feet below the surface to prevent thermal shock. Cracking down on the roughly 100 mostly illegal dams in central Washington would be a good starting point for restoring the fish runs, Sears said. The smaller dams and barriers notwithstanding, the single overriding problem continues to be moving fish past the major hydroelectric dams. Solutions are possible, but funding is key, which is one hope for the outcome of the renegotiation of the Columbia River Treaty, which is nearly complete. Perhaps the most unique option for boosting fish over large dams is being developed by Whooshh Innovations, a company that is testing a flexible sleeve that rapidly moves fish using a pressure differential. The first tests will move fish 200 feet with a 50-foot rise, but the company is already thinking of much larger numbers, a minimum of 1,000 feet with a 236-foot rise. "Our model indicates it would take a fish 25 seconds to make that rise," said Deligan. "Do we want to go over something like Chief Joseph Dam? Absolutely." Just one visit to Grand Coulee Dam put the money needs in perspective. 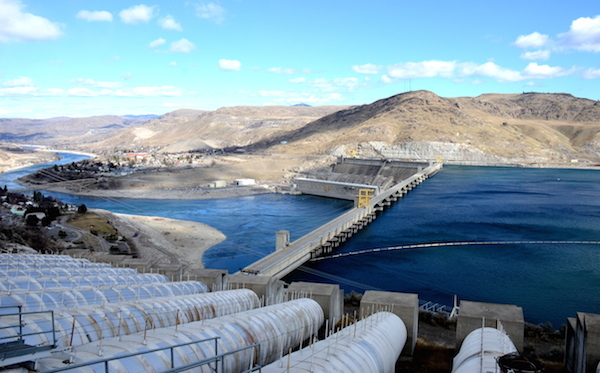 Over the next 10 years, $400 million will be spent for turbine retrofits at Grand Coulee. Each year, $70 million goes toward operations and maintenance. Fish-passage solutions pale in comparison. "These huge outlays of money make one realize that installing fish passage facilities is not a financial impossibility," noted Lumley, who emerged from the workshop optimistic about the April conference. "This workshop exceeded my expectations in terms of identifying real solutions to restoring fish passage," Lumley said. "It was mostly technical, but also [yielded] some really helpful suggestions for us on the funding side of it, and also in asking our leadership to reconsider some of the bad historical decisions that have been made and to right those wrongs."